It is the worldwide biggest dinosaur-show with huge animatronic dinosaurs. Titanosaurus, Giganotosaurus and Aucasaurus meet in one of the dry landscapes of Patagonia during the cretaceous period. They threaten each other and their recently hatched young. One of the early mammals can only keep a low profile! An impressive and unique show-experience! The 800 m2 large play-area won’t leave a child’s wishes unfulfilled by offering among other things a ball-volcano and –waterfall and trampolines. Raised 2 meters above the ground, there is an obstacle course - secured by ropes and nets - that guides the young explorers on elastic floors through tunnels and fast slides across “Gondi’s Dinowelt”. Time travel is possible! With time fog and a time fluid generator visitors of the Time Travel Section will be guided by Z.E.R.A. Time-Express Travel Agency step by step through the most important times during the history of mammals and mankind. 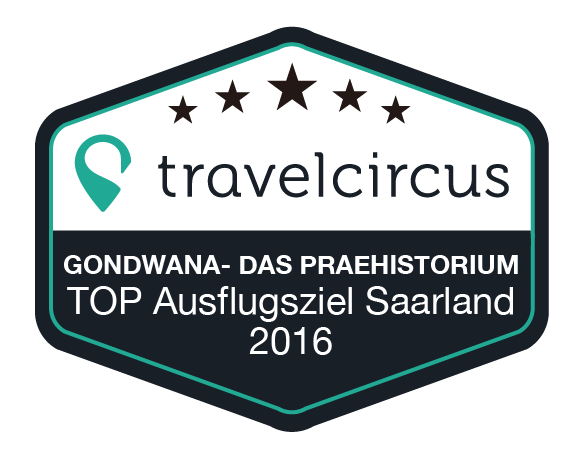 That’s what was missing from GONDWANA - Das Praehistorium up to now: The modern age with the evolution of mammals and mankind. Perfect light, sound and simulations turn Time Travel into a special experience.